MC and I have generally been pretty easy-going when it comes to travelling. We like to explore, and have taken a few weekend excursions to celebrate events (birthdays, anniversaries, etc. ), or just to visit her folks. That was before having the baby. Any thoughts for travelling easy, or at a moments notice go flying out the window faster than a speed limit on the interstate. A simple weekend getaway to visit in-laws now requires two to three days of advanced planning (which can still get tossed before setting off from the house). Which is where we get to the best laid plans getting shot to hell. MC had packed his clothes the night before we left. On the day of our departure, she worked a half-day while I kept him at home. During that morning, she talked to her mother and was informed of a cold front that had been squatting over them. Temps around 60, in August. So MC wanted to repack his clothes to adjust for the cooler (and rainy, it turned out) weather. We made sure he was well fed and watered before we left the driveway, and he was asleep before we hit the city limits. Ah, the bliss of a sleeping baby in the car. So we thought, for the first hour of the trip. By the hour-and-a-half mark, he was awake, and starting to get cranky. 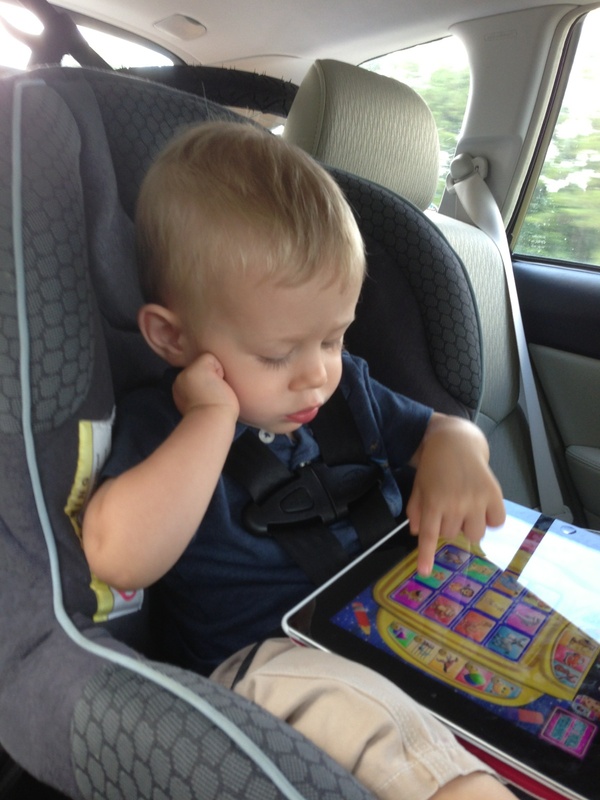 We tried various means to stave off full toddler cranky-dom, before resorting to one of his favorite things: the iPad. For the last stretch of the journey, I sat in the back with him, and cycled through his routine of games or pushing on things, until we arrived. This entry was posted on August 21, 2013, 13:48 and is filed under Baby Dragon. You can follow any responses to this entry through RSS 2.0. Both comments and pings are currently closed.